Pulitzer Prize-Winning Author David McCullough on Architecture’s Debt to History « R. Miller Architecture, Inc. Architecture and history are inseparable, as are American and European architectural history. “History, however expressed, is an antidote to the hubris of the present, and we will be judged by history no less than those who went before us,” said historian and best-selling author David McCullough at the opening-day general session of the AIA 2012 Convention yesterday in Washington, D.C. Architecture, he explained, is a way to uniquely access history and human accomplishments of all kinds. In a morning session that illustrated the enduring power of both architects and architecture, McCullough drew on numerous examples from his long and distinguished writing career, which has earned him two Pulitzer Prizes and a host of other awards. Underscoring the convention theme of “Design Connects,” the Yale graduate recounted how one of his early mentors, Yale’s esteemed architectural educator Vincent Scully, talked about art and architecture in the “context of everything.” Scully’s lecture on the Brooklyn Bridge started McCullough on his own dramatic account of that epic engineering feat in his early best seller, The Great Bridge, which will be re-issued in a special 40th anniversary hardcover edition this fall. McCullough referenced the power of light in architecture as both a principle of American enlightenment, and a design strength of much-admired Paris, the city of light, and a close urban planning cousin to Washington, D.C. America’s leading 19th century architects, like H.H. Richardson, Richard Morris Hunt, and Charles McKim, learned their trade in Paris at its Ecoles Des Beaux Arts. They traveled to Paris for training in architecture they couldn’t get anywhere else. McCullough traced how the impact of French architecture went back to the 1780s, starting with Thomas Jefferson who lived in Paris for five years as American minister to France before his presidency. While in France, he wrote about architecture often in his letters, and the Hotel de Salm in Paris inspired the dome at Monticello. Jefferson’s design for the Virginia State Capitol in Richmond was inspired by his trip to Nimes and its Roman-era temple, the Maison Carree. Speaking in Washington, D.C., a city designed by French urban planner Pierre L’Enfant, McCullough also referenced the experiences of the young Americans he profiled in his latest book, The Greater Journey: Americans in Paris. Their experiences were endlessly shaped by the architecture they found there. The book profiles expatriates in Paris during 1830 to 1900, including painters John Singer Sargent and Mary Cassatt, sculptor Augustus Saint-Gaudens, medical student Oliver Wendell Holmes, Sr., abolitionist Charles Sumner, inventor Samuel Morse, and others. He explores why they chose to journey across the Atlantic, back to the old world, and the answer was both to launch careers for which there was no training available here, and to achieve excellence in whatever they pursued. 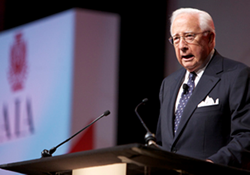 David McCullough addresses attendees at the AIA Convention on Thursday. Image by Matt Martin.